Ashley Barnes' opener at Anfield may have been only the ninth the Clarets have scored on the road in the Premier League so far this season, but they have now netted in their last 12 Premier League games. Two seasons ago they were relegated having scored 28 goals in 38 games. This term they already have 31, with 10 games remaining. Since the 1-0 defeat at West Ham just before Christmas, the only times they have failed to score have both been in the FA Cup, at Sunderland in a goal-less draw, and the surprise exit at home to National League leaders Lincoln City. They have also now scored against Chelsea, Spurs, Arsenal, Liverpool, Manchester City and Everton - indeed, the only sides they haven't scored against in the league are Manchester United, West Brom, Stoke and West Ham, who all have yet to come to Turf Moor. Without wanting to sound like a stuck record, Burnley are getting closer and closer to that elusive away win. While the last thing some fans will want to hear after a 12th defeat on the road this season at Anfield on Sunday, there were many positives to take. The Clarets' tactical plan worked to a tee, as they pressed Liverpool, forcing the Reds to abandon plans to play out from the back, making them play long and early for Divock Origi and Sadio Mane. Michael Keane and Ben Mee were towers of strength against that much-vaunted duo, while Phillipe Coutinho was so peripheral to the action, he was withdrawn on the hour and replaced by the 17-year-old Ben Woodburn. We had the sight of Liverpool, at Anfield, bringing on defensive midfielder Lucas for Origi to try and close the game out, with the Reds time wasting and trying to keep the ball in the corners. Jurgen Klopp said they won "ugly". The Liverpool Echo said it was more like "hideously grotesque". They were fortunate to get the three points, and while it was the same old story for Burnley, they should be heartened. They have now lost seven of their last eight away games by a solitary goal, and gone down 2-1 at Spurs, Arsenal, Manchester City and Liverpool. As Klopp also said: "It’s really difficult (against Burnley), but if you see the results, even if they have not the best away record, the games they’ve lost, most of them are really close." 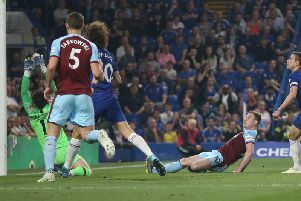 I wrote after the 3-2 defeat at Swansea City that fans needed to be patient with record signing Robbie Brady as he adapts to life with Burnley following his £13m deadline day move from Norwich City. And boss Sean Dyche left him out of the side at Liverpool after a slow start to his Clarets career - magnificent free kick against Chelsea aside.